The Northeast U.S. states Thursday morning were hit really hard with a serve snow storm. News predictions say that snow can land from 4 to 12 inches, and winds guts were getting up to 35 mph. The Northeast – including New York, New Jersey and Massachusetts -- is in bad condition. Hampton University campus journalists who were enjoying 40-degree temperatures and clearing skies, checked in on family and friends in the snow-afflicted states. "The weather right now is around 20 degrees and we're expected to get 12-18 inches of snow," said Tiyanna Jenkins, a freshman, marketing major at American International College in Springfield, Massachusetts. "But the worst part is trying to figure out what I'm going to eat because classes are canceled, the campus is closed, and none of the shuttles are running. "The weather is so bad, I can't go outside, so I may just rely on snacks for the rest of the day." 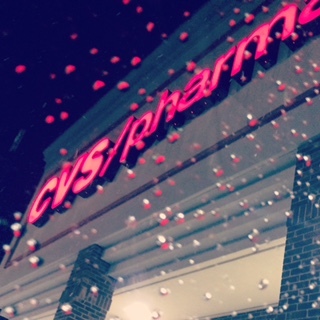 Mindy Montgomery of Carteret, New Jersey said, "Right now the snow is coming down around 2 inches per hour. For me I know I will not be leaving the house today. Government is asking people to stay off roads, unless they really have to drive due to the awful driving conditions. "The worst part is the wind. It's causing the snow to blow everywhere." Iyonce Jackson of Roosevelt Island in New York City said, "There's a good 3-4 inches in my neighborhood right now, but the snowfall is still very heavy. The amount of now will probably go up to 5-6." Lafleur Derrick of Decatur Street in Brooklyn's Bedford Stuyvesant neighborhood said, "I'm snowed in, and cannot go to work because it is dangerous. Public transportation are running with fewer buses and trains. "On the bright side, I am very well prepared for the storm, I did some grocery shopping before the storm started." A mini lake formed outside of at least one of the Hampton University dormitories Saturday night, holding students hostage in their residences, said student eyewitnesses. Coastal flooding related to Hurricane Matthew was the culprit. Lauren Hendricks, a senior from Texas, said she witnessed the water mass. Briana Oates of Maryland, also a senior, said, "It definitely flooded here in Hampton last night. 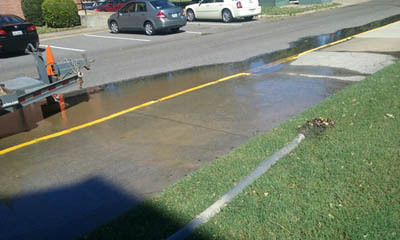 The grass became mini pools outside of the Multi-Use Facility, in between Armstrong and Ogden [halls]. "Streets were flooded to the point where shopping centers closed early, some stop lights were out. Pizza companies stopped delivering. There were high winds and some power outages across the bridge. Damages were not too bad and power did not go out in the dorms, just lights flickering occasionally. But, I did hear that some people's cars got hit by tree branches." Hampton University Police with the National Weather Service issued a flood warning at 6:49 p.m. Saturday and followed up at 7:43 p.m. with a flash flood warning. "Excessive runoff from heavy rainfall will cause flooding of small creeks and streams, urban areas, highways, streets and underpasses, as well as other drainage areas and low-lying spots," said the communique sent by text message and email. "Traditional low-lying areas are Lots 9, 32, Shore Road, Ferry Road and Queen Street across from the cafeteria. Relocate to Lots 21 (across from the cafeteria, and Lot 41, adjacent to the Health Center. or lot 10." 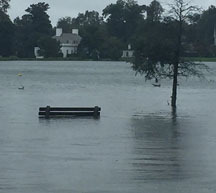 According to The Weather Channel, overnight, about nine inches of rain pounded the Peninsula [Hampton and Newport News] and South Hampton Roads [Norfolk, Virginia Beach, Portsmouth, Chesapeake and Suffolk], which resulted in flooding, downed trees and limbs, and power outages. "As of right now," said Oates in a mid-Sunday afternoon email, "the sun is slowing peeking through the clouds and the streets are dry." The snow that paralyzed the Washington, D.C. metro area the night of Wednesday, Jan. 20 missed the Hampton University community, however, a number of faculty and families of students here were touched. Drew Berry, a professor at the campus' Scripps Howard School of Journalism and Communications, left his home north of Baltimore Thursday morning at 5 a.m. What was usually a four-hour drive, he said, turned into a seven-hour headache. He encountered a number of icy roads and witnessed several car accidents. "It was a nightmare," said Berry, who intends to stay in the Hampton Roads area until Monday. The evening before, after snow suddenly hit Washington, D.C., Scripps Howard's Dr. Mavis Carr received a disturbing text from her daughter-in-law, Nicole Eley-Carr, who lives in that area. For her, a productive day at work had quickly turned into a Wednesday night of disaster. Eley-Carr left work, as usual, and proceeded to drive home, but her car stalled on a road approximately 10 minutes from her Accokeek, Maryland home. After restarting her car and attempting to navigate the hilly, winding road home, her vehicle and others began to slide precariously backward down the snow-dusted hill. Eley-Carr then made the decision to park near a CVS and resigned herself to spending the night in a place that at least had food. While perusing the shelves, she recalls that "one of the first smiles" she saw was that of the father of a former student of her mother-in-law Dr. Carr. As they chatted, he learned that Dr. Carr had taught his daughter at Hampton University a couple of years ago. He was nice enough to go out of his way and drove Eley-Carr home, after his wife arrived in their SUV. When she got home, Eley-Carr and her husband decided to go get some things from the store. Once there, they found the shelves bare. They now are preparing to hunker down for the Thursday night snowstorm. Wednesday night was referred to as "Carmageddon 2.0," as D.C. snowfall took over the streets. According to Fox5-TV, part of interstates 95, 495 and 270 were jam-packed with cars, and there were numerous Thursday-morning school delays. Virginia State Police responded to nearly 200 traffic accidents and, as reported by Fox5, Fairfax County stated that there had been at least 50 vehicles crashes. Winter Storm Jonas was projected to pack up to 16 inches of snow, leaving millions of people in the D.C., Baltimore and New York area frantic in anticipation of its arrival. Multiple East Coast states have been under emergency blizzard watches, winter storm watches, winter weather advisories or freezing rain advisories. Baltimore is expected to receive at least two feet or more of snow. Jamie Miller, lifelong Baltimore resident and grandmother of Scripps Howard student Jasmine Charles, said, "We're a little scared because over the years we've been spared from most of the more disastrous storms, but all the while knowing that something like this would happen sooner or later. So we're just waiting to see what happens." Phillip Jackson and Jasmin Charles contributed to this report. The writers are students at the Scripps Howard School of Journalism and Communications. On Thursday, Nov. 7, Super Typhoon Haiyan, or Yolanda, touched down in the Philippines. It was only there for a matter of hours, but it left behind a path of destruction and despair. The U.S. Navy's Joint Typhoon Warning Center estimated peak winds to be 195 mph, with gusts of 220 mph. Officials believe Haiyan may have been one of the most intense tropical storms in modern history. Tacloban, the capital city of the province of Leyte, was hit the hardest. Two of my siblings only lived a couple hours south of Tacloban, in another coastal city named Abuyog. The last I heard from them, they had evacuated from their homes to wait out the storm. That was Thursday night, before the storm knocked out all means of communication from the island. Thus began the most terrifying and anxiety-ridden weekend my family has ever endured. As the death toll estimate increased, so did our fears. My mom went into a panic after seeing the death estimate reach 10,000. Watching the destruction of Tacloban on the news devastated me, but I couldn't avert my eyes. To see looks of horror and unimaginable grief on faces that resembled my own relatives broke my heart. Maybe if I was lucky, I could catch a quick glimpse of one of my missing family members. Maybe if I was unlucky, I would see their bodies among the others strewn throughout the debris. I just wanted to know. Nothing was worse than the unknown at this point. Each day, I checked every news outlet imaginable to find anything about the status of Abuyog. I even went to my mom's house and sat through hours of The Filipino Channel's news broadcasts even though I don't understand Tagolog. I also employed various methods to search for my siblings and their families. I checked the Red Cross's list of survivors, and I submitted their information to the Google Typhoon Yolanda missing person finder. It was strange, and so upsetting, to attach each picture on their individual profiles. Especially upsetting was the missing person profile I had to create for my infant twin nephews, James and Jason, both only three months old. Four nerve-wracking days after the storm hit, my mom received a call from my oldest brother Efren late Sunday night. Everyone was alive and well. The house my mom built for Efren was still in tact, but severely damaged. However, my older sister Brendalyn and her family lost everything. Their house was wiped out by the storm, but they still considered themselves lucky. At least they escaped with their lives. Haiyan's aftermath thrust the Philippines into the international spotlight. Images of its citizens suffering saturate every news outlet as the numbers of the unfortunate continue to rise. As of now 620,000 people have been displaced, according to CNN. Survivors are running dangerously low on food and water, and the water they do have is contaminated. To make matters worse, there's new tropical depression that made landfall in Mindinao three days after Haiyan's devastation. Although many organizations have reached out to aid the disaster-stricken country, relief is still slow going. The Waray Waray Association, a Hampton Roads group of Filipinos who originated from Leyte, has scheduled a fund raiser to help expedite relief for Haiyan victims Nov. 29 at the Philippine Cultural Center in Virginia Beach. Tickets are $20, and the event begins at 6:30 p.m. The writer is a junior at the Scripps Howard School of Journalism and Communications. 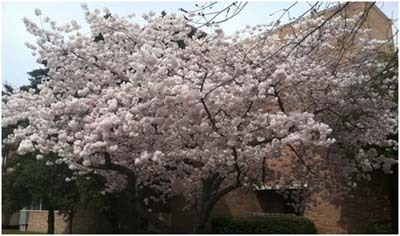 Put away your mittens and earmuffs, warm weather has finally graced the campus of Hampton University. With temperatures rising to the low 80s, everyone seems to be in a brighter mood. With these erratic temperatures, however, the question is if this weather is really here to stay? This week alone, the campus is participating in a variety of outdoor activities, such as a water fight on Bemis Lawn. What price are we paying to enjoy this beautiful weather, and does anyone care to find out? 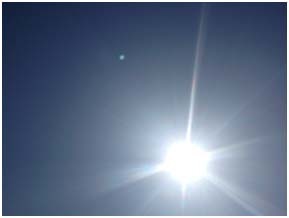 Scientists have noted 2012 as the warmest winter the country has experienced in an entire decade. Two-thirds of the United States has been abnormally warm, and global warming is, unfortunately, getting worse. According to the Environmental Protection Agency (EPA), greenhouse gas emissions into the atmosphere will continue to increase unless our emissions begin to decrease substantially. Furthermore, the effects of global warming include an increased average temperature on Earth, a raise in sea levels, and frequent destructive hurricanes and tornadoes. These changes will impact our supply of food, water, infrastructure, ecosystems and even our health. "It's getting hotter every year, and it's messing up the climate balance that we are used to. The fact that it is 70 degrees in February is a problem," stated sophomore broadcast journalism major Meghan Kee. It is obvious to see that we all have been looking forward to the warm weather, activities and longer days that spring brings. However, is the warm weather actually making our days shorter as a result of global warming? The human race must be careful for what they ask for because the warm weather could ultimately lead to a more crucial problem. Waking this morning Hampton University, students were excited to see the weather predictions were correct; after months and months of cold brutal weather, spring is finally here. Students have been praying for so long for weather that allows them to wear shorts and sandals, and today their prayers were answered. The sun is shining, skin is showing and spirits are high. As students congregate around the Scripps Howard School of Journalism and Communications, they take in the rays of the sun and enjoy the feeling of well ... being outside! "It feels great, the weather is great, spirits are high, and it brings about a good attitude," said sophomore and political science major, Daniel Brown. However, while some feel productive and in high spirits, others find the weather contributing to their inner laziness. They find themselves hanging on the waterfront and in the Student Center catching up on the latest goings-on around campus. Strategic communication major Ashley Hendricks chimed, in saying, "The weather brought about laziness, because everyone wants to be outside ... It makes me not want to go to class." Now that spring is here, students are finally breaking the winter blues, and the campus is glowing. Enjoying the final weeks of the semester and the warm weather, students are full of cheer here at Hampton University because spring has finally arrived!